Argolis or Argolida is located on the peninsula in the north-east of the Peloponnese and is bordered by mountains and the sea. The mountains combined with the riches of the underground currents and cisterns of its fertile plains, together with its mild, friendly climate, made the area ideal for the development of civilization. The mountains of Arachnaio, Didymo, and Aderes impose their dominance in between the valleys of Kranidi and Ermioni on one side and the Valley of Lygourio which stretches out to the magnificent bay of Epidauros on the other. Mycenae is where Zeus, transformed himself into golden rain and visited the beautiful Danae, the great granddaughter of Danaos. From this union, Perseus was born. Based on the Homeric epics, Schliemann began a series of excavations in 1850, and proved that behind the imaginative ancient myths lay a most significant civilization. Visiting Ancient Mycenae today, you will see the unique Gate of Lions with its Cyclopic walls as well as the Funerary Circle A, the magnificent Mycenean palace with its consequent rooms and numerous dwelling houses. The town of Argos has a history which goes back thousands of years. The city was at the height of influence at the end of the 7th century BC, extending its influence and power over the Eastern Peloponnese. It is also the birthplace of great sculptors such as Ageladas and Poliklitos and was one of the most important cultural centres of the ancient times. Plenty of invasions and attacks followed and finally Argos was conquered by Greeks, Venetians, Romans, Goths, Slavs and Byzantines. During the Byzantine period, the city became a significant agricultural centre but it fell under the rule of the Franks (1212) , the Venetians, (1388-1463 and 1687) and finally the Turks until 1821. The visitor to Argos can see the Acropolis of Larisa, the temple of Pythean Apollo and Athena ,the Mycenean graveyard of Deirada, the “Virgin of the Rock” (built on the ancient temple of Hera Akrea), the 20,000 seat ancient theatre of Nympheum where the 4th International assembly took place, the Roman baths, the Ancient Agora, and the temple of Aphrodite. Further down the list of important sites are the churches of Saint Peter, Bishop of Argos and that of Saint John, the barracks of Kapodistrias and many other noteworthy neoclassical buildings. The Museum of Argos is located in the neoclassical Kallergis house. On the road that links Argos to Nauplio/Nafplio is the Acropolis of Tyrins, one of the most important cities of Mycenae, closely linked to the name of Hervules since it is believed to be his birthplace and the starting point of his mythical labours. The city was founded by the hero Tyrins, son of Argos and grandson of Zeus, who according to legend was the one who built the impregnable walls with the help of the Cyclops. Inhabited before the Bronze age, Tyrins flourished until the descent of the Dorians and was destroyed from the Argians in 460 BC. If you visit Tyrins today you will be stunned by the mythical Cyclopian walls, the tunnels as well as the palace, parts or which are decorated with frescoes. 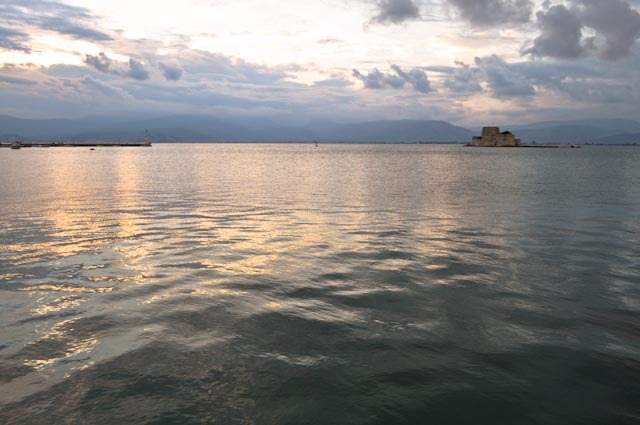 The city of Nafplio held a key position which enabled sea communications, but is also protected by the steep rock of Akronauplia, a combination which made Nauplio ever since the Neolithic era, one of the most desirable places to live but also a target for conquerors. Nafplio was repeatedly invaded by Argians, Goths, Slavs and Albanians, Byzantines, Franks, Venetians and Turks. 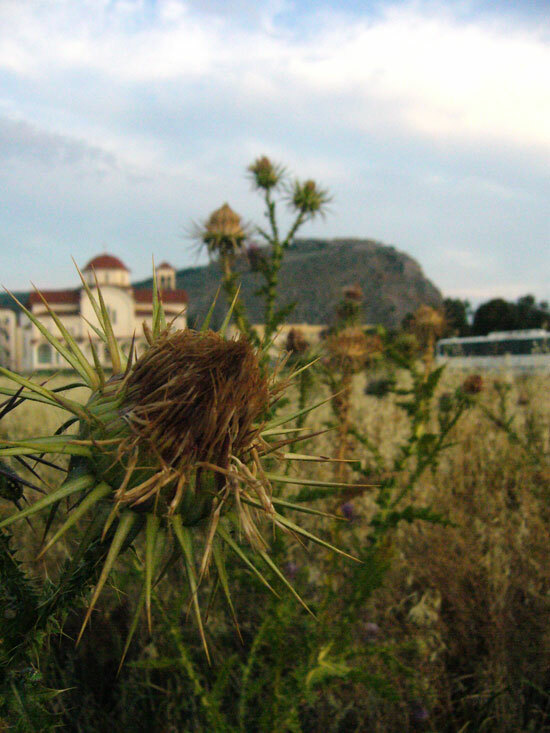 Until 1822 when the Greeks revolted against the Turks, fought and won back Palamidi and finally, Nafplio. In January 1823, it became the seat of the temporary government of the Greek nation. In January 1828, the first governor of Greece came to the city, but a few years later in 1831 he was assassinated near the church of Agios Spyridon. A period of anarchy and upheaval will followed until King Othon, accompanied by 36 foreign vessels and a large retinue arrived in Nauplio bay in January 1833. The next year, the Greek capital was transferred to the city of Athens. From an architectural point of view, Nauplio is an amalgam of Frankish, Venetian and Turkish buildings both secular and neoclassical. Its broad streets and small alleys, its squares, Ottoman fountains, monuments, statues and beautiful parks paint the portrait of a most charming city which captivates its visitors. Visit the Archaeological Museum and its abundance of archaeological findings, the Museum of the Peloponnesean Folklore Institute, the fortified Akronauplia and Palamidi with its magnificent Venetian castle and the endless hewn steps. After relaxing and enjoying a cup of coffee next to the Pili of Xiras, with its peculiar waterfall which looks as if it's springing out of Palamidi's soul, or opposite the old train station which brings back memories of the past, you can start your stroll around the city. Do not miss the recently opened cultural centre in Nafplio, Fougaro, which is a renovated stone factory complex with a large chimney from which is gets its name. The centre has a library, large exhibition centre, lots of outside seating, a gift shop and a lovely cafe restaurant. More details on Fougaro.gr (www) on the web. Inhabited ever since pre-historic times, the rock of Akronauplia offers the most breathtaking, panoramic view! From one side lies the old city with its numerous tiled roofs, the churches' belfries with the unique Bourtzi fortress standing like a stationary ship amidst the waters of the serene harbor, and from the other -which is full of fig trees hanging from the rocks- the stunningly beautiful view of the Gulf of Nafplio and the beach of Arvanitia which hides under the dominant presence of Palamidi, which will be our next stop. If its 990 steps sound like an intimidating number to climb, don't be discouraged. There's a paved street which takes you all the way up to the top and to one of the two entrances of the castle. So, if you decide to go on foot, be certain that the impressive, well preserved Venetian fort and the wonderful view of the Argolic plain will be more than rewarding. After a swim at Arvanitia, or the nearby Karathona beach, relax over a good meal in one of the many tavernas and prepare yourselves because in the evening the city transforms into an endless promenade. As soon as the afternoon sun begins to set, the city looks like a colorful human bee-hive full of tourists, permanent residents, Greeks and foreigners who have settled here from all over the world. 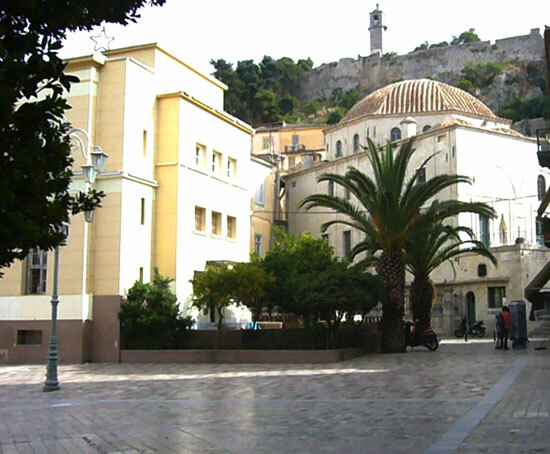 From the foot of Palamidi with the Staikopoulos park, the Pili of Xiras, the house of Armansberg, the courthouse, Kapodistria's statue and the Trion Navarhon square with the first pharmacy of Greece, the first gymnasium (today's Town Hall), the Army Cadet School, King Othon's statue and Platia Syntagmatos (Syntagma Square) with the house of Kolokotronis, the old Vouleutiko (Parliament), the Mosque, the prison of Leonardos, and the archaeological museum, - which used to be an old Venetian warehouse- the visitor takes a journey into a unique place of historical memory. Leaving Asini we reach the popular and well-known tourist resort, Tolo. Its history goes back many centuries and it was known during the Venetian period as Porto Di Rodgi and Port Aulon..
During the rule of King Othon a resolution was passed which allotted Tolo to families of Cretan refugee fighters. 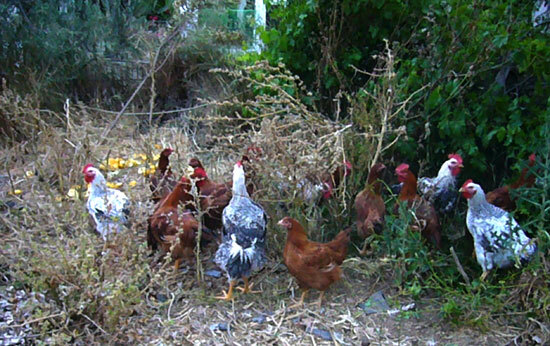 Its inhabitants followed the traditional hospitality and remained friendly and hard working. The natural beauty of the bay and the tranquility offered to its visitors by the enchanting landscape surrounding it, transformed the once picturesque fishing village into a modern tourist resort comprised of hotels, rooms for rent, apartments and camping areas which add up to a total of 7000 rooms. Built practically on the beach, the traditional taverns and restaurants, bars and clubs playing both Greek and foreign music, create a cosmopolitan atmosphere to satisfy all tastes and ages. The uniquely beautiful sea is the perfect place for both family holidays but also for younger people who wish to have a lot of fun, since Tolo's sandy beach is one of the best organized one when it comes to sea sports. Don't forget to visit the picturesque islets of Romvi -Daskalio and Koronisi for a swim in their small, isolated beaches or even a barbecue. 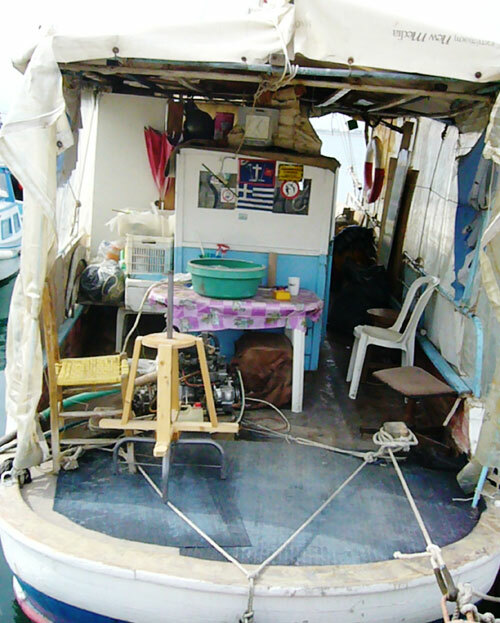 You can reach the small islands by boat, canoes or water bicycles, which are all available. 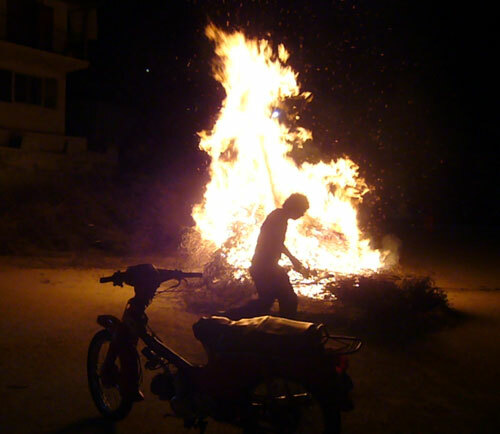 During the numerous cultural festivities, don't miss being a part of the fun offered by the carnival during the Apokries (Lent) period, and in the popular fetes of Psara and Trata at the end of September. Located in a most charismatic position, in the midst of the peninsula's plains, Kranidi is built on the boundaries of the ancient city of Masitos. Its name is possibly credited to another version of the word Koronida which was the name of the small islet of Kilada. With its permanent residents occupying themselves with agriculture and cattle breeding but also with commerce and shipping, Kranidi started to develop around the chapel of Agios Ioannis - the Metropolis of Kranidi today- and reached a great economic peak which allowed it to have a leading role in Greece's effort to overthrow the Turks and win back its independence. The characteristic buildings of the local architectural style like the Town Hall and the Library, the five big churches of the 19th century- the most important one being the Metropolis of Agios Ioannis- the Well of Pyrgos, the three fully restored windmills and the traditional oil mills, make you feel as if you have traveled back in time. Wherever you look, you will see small white chapels embracing the city. The area of Ermioni has been inhabited from around 3000 BC, and was an important commercial centre then. The name of Ermioni is mentioned for the first time in Homer's Iiad as one of the cities which took part in the Trojan war. comments. Built in the ancient hillside Pronos, it slides down smoothly to the sea which embraces both its sides, creating Limani in the north and Mandrakia in the south. The visitor, after enjoying some ouzo with mezwa in the village of his choice, can start getting acquainted with Ermioni by making a tour of Bisti. Bisti is a small piney peninsula in the edge of the town and at the same time an outdoor archaeological site. During the summer, swimming is extremely enjoyable in crystal clear waters. Walking around the city you will see the renovated white windmill, the remains of the old town's castle and the foundations of the ancient temples. From the east, the horizon stretches out to Dokos and Ydra. Ermioni is the starting point from which one can travel to the Saronic Islands. There are a lot of sandy beaches around Ermioni like Kouverta, Bourloto, Petrothalassa, all of which have modern luxurious hotel estates. For dinner, fresh fish is highly recommended and so are a few drinks at the bars, before returning to your hotel. Those of you who appreciate good wine, must visit Iliokastro - its ancient name was Ileoi - which is linked to this sweet tasting wine. The ascending but passable street offers you a panoramic view of the coasts and leads to this small traditional village and its taverns. If you wish to go to Ermioni's east most shores, then Dardiza and Thermisi, a small village in the midst of meadows, which smell beautifully during springtime, are the right places to visit. There are many hotels next to Thermisi which is crowned by a Venetian castle. Portoheli is located opposite to the ruins of Alieon. The ancient village of “alieis”, a suburb of Ermioni, owe their name to the main activity of its inhabitants who were fishermen. As time went by the village's name became Alieis Heli and finally Portoheli since the town was and still is built in a natural port. The remains of the ancient city both on land with the Acropolis of Alieis and the bottom of the sea where the walls of the ancient port and the Temple of Apollo have been found, survive. From Portoheli the visitor has the opportunity to explore and discover many isolated small bays and wonderful beaches like Ververonda, Korakia, Hinitsa, Kosta, Kostoula, Limanakia, Agios Emilianos, Kounoupi, Tzemi, Petrothalassa and many more. Also from Portoheli there is easy access to the islands of Spetses and Hydra as well as Monemvasia and other beaches on the east coast of the Peloponnese. From whichever direction one wishes to approach the area of Epidauros, either from the north following the captivating coastline from Corinth, or from Nauplio via Lygourio, you will be utterly impressed by the natural beauty of the area. The city of Ancient Epidauros is built where the actual ancient civilization of Epidauros flourished, not far away from the Sanctuary of Asklipios and the well-known ancient theatre. Epidavros it gradually became an important centre and held its own colonies. Here was the Sanctuary of Asklipios, a temple dedicated to Dionysus, a grove dedicated to the goddess Artemis and the Sanctuary of the goddess Aphrodite, while in the area of the peninsula which protectively embraces the waters of the harbor, the excavations of the Sanctuary of Hera brought to light chamber- like Mycenean graves, a cemetery with engraved tomb stones and a vast variety of statues and inscriptions. The Small theatre of Epidauros with its 6,000 seats, hosts high quality cultural and artistic events and celebrations and was discovered in the same area of the peninsula in a well preserved condition. All of these unique findings combined with the area's natural beauty and mild climate, have transformed Ancient Epidauros into the perfect holiday resort. It is an ideal place for swimming, sea sports, trekking and having lots of fun since it is a well-developed tourist area, having many hotels, rooms to rent, camping, fresh fish tavernas, cafes, bars and clubs. While staying at Ancient Epidaurus the visitor can visit the sea-side town of Nea Epidauros with the house in which the First National Assembly took place from the 21st of December 1821 until the 15th of January 1822. After the completion of its activities the first Constitution of Greece was voted and its declaration of independence was announced. You can also visit the Mycenean graves at Palaiohori, Agia Marina, Katholiki and Limnes as well as the beautiful scenery of Gallos with the Acropolis and the Cyclopean Walls. The Asklipeio of Epidauros functioned as both a religious and political centre of the city state of ancient Epidauros a city of rather small importance which lived under the shadow of powerful centres of the time - Corinth, Sparta and Athens. 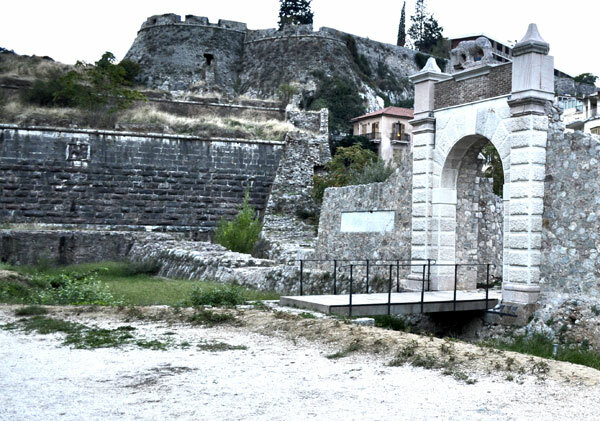 The Asklipeio of Epidauros was considered the birthplace of medicine. The rituals of worships in Epidauros date back to the 6th century BC. The water which gushed from the springs played a crucial role in the worship rituals. The catharsis with water and the communion were considered to ensure a life of health and happiness. After the fall of the Mycenean world the sanctuary came back to life around 800 BC during the period that city-states were created. Worship at this time was under the protection of the god Apollo. The fame of the sanctuary is gradually increased as did the number of pilgrim which is why it had to be transferred and in the middle of the 6th century to its present location. The worship of Apollo gradually faded until the worship of his son, Asklipios took over. The great era of the sanctuary of Epidauros were the 3rd and 4th centuries BC. Under Roman rule in the 1st century BC, the sanctuary suffered significant damage. In the 2nd century AD, the sanctuary flourished once again and the worship continued until the official restriction of ancient worship in 426 AD. Excavations were made at the end of the previous century by the archaeologist Panagis Kavvadias. Between 1954-1963 the theatre was restored by A. Orlando, while excavation has continued since 1984 and conservation of Epidavros' monuments continues. The excavations, which started in 1880 were completed with restorations in the 20th century, revealed the most consistent world-wide, perfect sample of an ancient Greek theatre. It has 55 rows of seats - which are divided in 12 tiers at the lower landing and 22 on the upper one- which host an audience of more than 20 thousand. From its stage room proscenium, only the foundations have survived. The last Thursday before lent is called Tsikno Pempti. by the young people in the village. 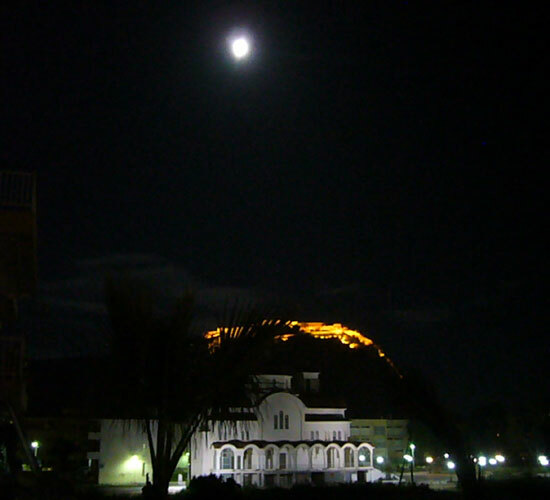 Nafplio church,moon and the Palamidi. 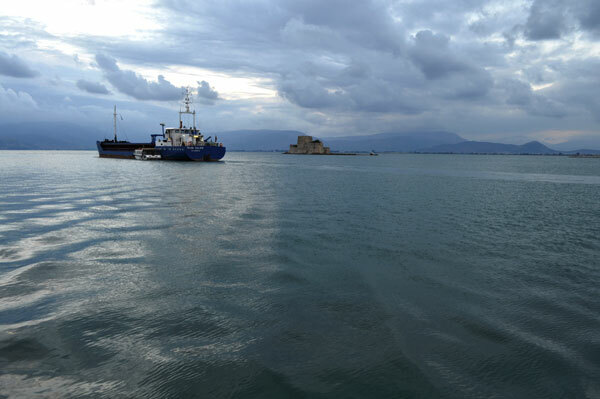 Nafplio harbour, fishing boat.